An exit exam for medical students at the MBBS level has been proposed - a move that health experts say is essential. A draft prepared by the health ministry of the Indian Medical Council (Amendment) Bill 2016 recommends an exit exam at the MBBS level, combined counselling at the undergraduate and postgraduate levels and reservations of up to 50% of the seats of the postgraduate courses for medical officers. 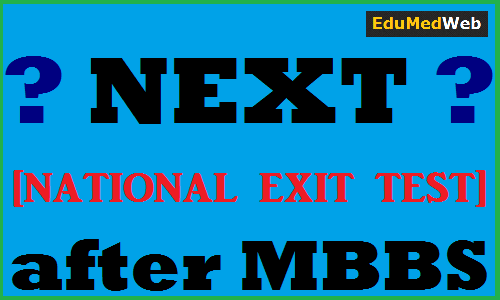 Section 10E, to be added to the Indian Medical Council Act 1956, proposes a uniform national exit test (NEXT) be conducted for all medical institutions at the undergraduate level. NEXT will replace the uniform entrance exam at the postgraduate level. Recently, the Health Ministry of the Indian Medical Council (Amendment) Bill 2016 has prepared a draft, suggesting an exit exam at MBBS level which is also associated with combined counseling at the undergraduate and postgraduate levels and reservations of about 50% of the seats of the postgraduate courses for medical officers. No impact will be found in case of foreign medical graduates if the exit exam is implemented. Although 12 states and 4 union territories express interest to this exit test to achieve the better quality of the Indian doctors but there are some other states that oppose this announcement. The states that showed interest to make NEXT mandatory include: Delhi, Puducherry, Chandigarh, Andaman and Nicobar, Chhattisgarh, Bihar, Maharashtra, Haryana, Jharkhand, Gujarat, Madhya Pradesh, Kerala, Meghalaya, Himachal Pradesh, Odisha and Punjab. Nine members of states, those who have refused to make NEXT mandatory include: Telengana, Rajasthan, Goa, West Bengal, Assam, Jammu & Kashmir, Karnataka, Uttarakhand and Andhra Pradesh. This proposal of NEXT has been made in order to improve the Medical sector including the replacement of the MCI with National Medical Commission (NMC). It is thought that NMC will manage UG and PG authorization, education and college ratings. An exit test is “an essential tool for meeting the basic objectives of quality and safe physicians for the society,” given the vast diversity of medical institutions in the country offering medical education of variable standards, says executive director, National Board of Examinations. The test is likely to be at the level of an MBBS final exam to assess the basic knowledge and skills of a medical graduate. According to one of the former president, Delhi Medical Council, the concept of an exit exam was mooted about six years ago to improve the quality of fresh MBBS graduates in India. Implementing NEXT will also put pre-PG coaching institutes at an advantage, say doctors. Will that be a good thing? Not likely, says president, Indian Medical Association Young Doctors’ Wing. Instead of churning out better doctors, India will produce more of medical graduates only with less clinical skill because of the burden of too many exams. More than 60,000 MBBS graduates clear the exam every year, says Drs. “Therefore, majority of the students will spend their time in coaching classes or in the library or studying at home; in a country where the doctor-patient ratio is already so low. NEXT is an indirect way to pressurise the doctors to go for the rural postings,” he adds. The proposed bill also seeks to introduce common counselling for undergraduate (UG) and postgraduate (PG) medical students. Counselling for 15% all-India quota seats at the UG level and 50% all-India quota seats at the PG level will be conducted by the Directorate General of Health Services and for remaining seats including private colleges and private/deemed universities at both levels will be conducted. Common counselling is already implemented for National Institutes of Technology and the Indian Institutes of Technology. Experts say such a concept for medical students will be a good idea. Medical graduates across the country have applauded the Central government’s proposal to conduct common counselling and the Delhi Medical Association has also supported it, apart from the Supreme Court upholding it. Common counselling at UG, PG and super specialty levels is needed to allay candidates’ anxiety about participating in multiple seat allocation processes conducted at institution or deemed university levels. “It will also ensure fair play and equity of access of seats to all aspiring candidates on a common platform,” adds Dr. The wastage of seats due to multiple admission processes running concurrently and variable criterion used for admissions will be minimised and boost chances of candidates getting admission only on merit.